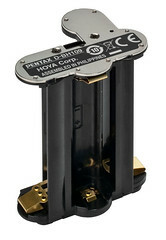 In my last article I introduced the K-r, the new "mid-line" body in the Pentax line. Here I'll share my opinions, noting that I had no access to a sample copy. 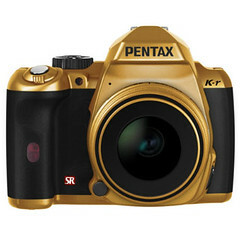 Is this the new Pentax golden boy (as pictured)? Or will it's image tarnish like silver? Silver or gold, this camera seems like a decent replacement for the K-x, with improvements in some of the areas we might want and others we might instead merely expect. The larger LCD will look lovely and feel less cramped than the smaller predecessor. I would have liked to see an articulated screen, however. This is not just a toy feature, but a good and useful tool for video and macro work especially, but also street shooting and so on. The improved frame rate and ISO range are gravy on top of already excellent performance for an entry-level model. Some chomp at the bit for ever increasing machine-gun capacity, but I am not one of them. Likewise ISO limits keep increasing, but the usable low-noise regime of the sensors hasn't changed so much. My K20D is perfectly decent in this regard. There has been debate among some Pentax fans on the usefulness of the AF point confirmation squares in the viewfinder, most of it of a rather self-interested nature. "Well, you can always centre focus and recompose" goes the usual justification for this rather striking omission. Which is true -- this technique works for me. But I do not presume everyone (especially beginners) wants to shoot this way. So I am glad Pentax has corrected the oversight this time around. The fact one can use four AA batteries in place of the proprietary battery is really neat. This is the best of both worlds. Unfortunately the adapter piece, "AA Battery Holder D-BH109" (pictured here) does not come with the camera but must be purchased separately. With almost no Pentax presence in stores, this equates to an expensive extra for most users. The mode dial turns too easily and is inevitably on the wrong setting when I pull the camera out of my bag. I never know what a Menu / Info button press will do based on my current screen. Though the system itself is rather slick, accessing it is a bit random. One cannot easily select multiple exposure mode, as this option is buried in the menus. (True on the K20D as well.) This option should be on the drive mode menu. There is no HDMI output, which I hear is important these days. There is no microphone input. I record using a separate digital audio device, but I understand that others might not want to stretch to this expense. There is no shutter release cable connection, though you can use a wireless release. So, how many of these problems does the K-r address? Well, none, so far as I can tell. That might be OK if the K-r was a simple replacement for the K-x, since it does at least have the advantages already mentioned. But it is not a replacement; the K-r is positioned as a more expensive, superior model. In order for it to be worth this premium it should indeed have addressed the major shortcomings of the K-x. I think the K-r is a bit of an orphan in the line-up, the same way the K200D was neither one thing nor the other. I recommend buying the cheaper K-x and putting the price difference into glass. Or, save up for the K-7 and enjoy superior build and ergonomics. But not all those pretty colours. While the K-x is a marvel at its price point, I would argue that (while valid) your list of deficiencies were probably not at the top of most people's lists. I would put your list under "nice tweaks" rather than expected improvements. However, IMHO, the camera market is splitting into 3 distinct tranches, each requiring tangible advantages over that beneath them: DSLR, EVIL and PNS. EVILS will shortly be providing lower-level DSLR quality images. Products like the K-x and K-r, without dual dials, will suffer. Pentax need to move into EVIL, but even there, the fact that the Sony NEX E-mount has been designed to accommodate FF has to be scary for everyone. The first wave of digital mortally wounded Minolta, the second wave will certainly hurt Canikon (and maybe kill Olympus and Pentax) as Sony, Panasonic and Samsung flex their electronics muscles. In the USA the K-r is being marketed only in black, red and white models. The samsung is more versalite, has built in flash and even uses better flashes. I think the kr is fantastic and would reather have it than the kx though I really like the kx. Everything about it just seems like a nicer camera even the new body modifications, there is also an infrared picture transfer that I think works like the eyefi wifi card. You can send you pictures to your computer or to another kr...pretty cool. A new type of tethering. I don't think the kr will be the giant the kx is in sales but it also has the new k5 to compete with and I can see many people upgrading to this new camera as it has ever the kr has and weather sealing and is a pro body. This is a nice blog I will at it to mine. I now have information that in the UK as well as the USA the K-r is being marketed only in black, red and white models. The kit lens will be the DAL 18-55mm zoom. How disappointing. I guess only the Japanese get the new tech and the new ideas. Thanks Fred for your extensive comment. I agree that some of the items I listed are just "nice tweaks". But different people have different priorities and any small missing feature can be a disincentive to purchase. Since these are small things, they should have been fixed. I do not believe Pentax need to move into a new market segment. Small cameras like the K-x show that all the benefits of APS-C can be yours in a form factor not much bigger than the far less capable cameras of the competition. And for less money too. The K-x was also introduced in Black, red, white and blue initially, and as sales died down (I presume) new colours were introduced. I really hope they add the DA 35 as a coloured kit option in 1 or 2-lens kits. True enough Mis. And IIRC many colours were later available... though not some of the totally outrageous combos found in Japan.